This week, I came across some interesting data on Kik that highlights the disruptive potential of messaging apps with respect to the advertising industry. At present, messaging apps are in early stages of becoming direct marketing channels for advertisers, and the engagement metrics show a clear trend. 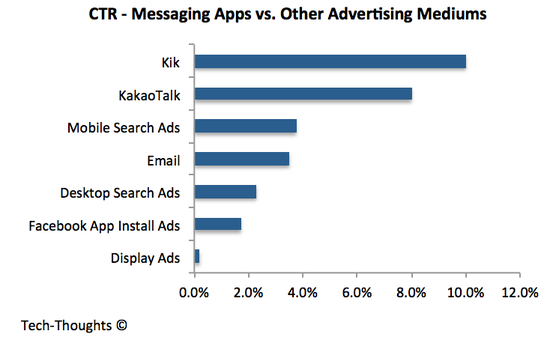 The chart above compares the click through rates on direct brand-to-consumer messages sent on Kik and KakaoTalk (through registered brand pages) to those on other digital advertising mediums. We can clearly see that the engagement rate on direct advertising through messaging apps doubles that of other best performing mediums. SMS is said to have an even more impressive engagement rate, but my hypothesis is feature phones drive much of that. Feature phones have limited notification systems and it is very difficult for consumers to ignore unread texts. But on a smartphone a text message is just another notification. If consumers use messaging apps for their texting needs, SMS messages can be as easily ignored as spam emails. The caveat here is that data points for both Kik and KakaoTalk are from individual case studies (from NowThis and Uniqlo respectively). But the similarity between both data points suggests that this aren't one off cases. KakaoTalk's CTR figure is actually a conversion rate for Uniqlo's coupons, which makes this even more impressive. Also, the figures for other advertising mediums like Email, Facebook and Search Ads are for specific time periods. These may not remain consistent across different time periods but they are unlikely to be off by an order of magnitude. Even when we take all caveats into account, we can still see that messaging apps have to potential to be a disruptive force in the advertising industry. This is caused by the fact that advertising on messaging apps negates the need for targeting. Brand pages on messaging apps have a self-selected audience, i.e. more likely to be interested in messaging from brands they follow. And unlike on Facebook, these messages are delivered through a notification system, by an app with which these users are already engaged. This explains Facebook's motivation in buying Whatsapp, its sky-high valuation and their disinterest in immediate monetization. If Whatsapp is successful in growing their user base and keeping them engaged, advertisers will line up whenever it opens for business. This also explains Google's keen interest in Google Now -- while it still relies on Google's machine learning ability and not self-selection, it does give them the ability to send notifications to an engaged audience.